Today we've got a fabulous guest post by the lovely Amy from Virginia Girl Design. Amy has written about her hacks for the Reversible Hobo Bag, with changes to the main panel, the straps and the side accents. "This pattern hack requires all of the same fabric yardage, interfacing, zippers and notions that are called for in the original pattern and will finish with the same dimensions. There are a few cutting changes to be noted on the main panel, strap and side accent pieces. Also, you will not need to cut the handle (pattern piece), flap or front catch pieces. Please read all instructions thoroughly before beginning. 1) We’ll begin the hack by cutting the main panels to be 21 inches wide by 17 inches high. 2) Find the center of the panel. Cut in half along the center and sew panel right sides together with a ½ inch seam allowance. Don’t topstitch yet! 3) Press center seam open, complete corner cut outs as instructed in original pattern then fuse fleece interfacing to the back of the main panel. Cutting a slim rectangle a little larger than your zipper box on the back panel will greatly reduce bulk. Repeat for other panel. 4) Now that your fleece is fused to your main panels, top stitch on either side of your center seam then install the zipper on your back panel. Install the “Handmade” metal bag tag on the front panel. I installed mine 6 inches from the bottom and centered. 5) Sew the main panels together on one long edge per the pattern directions, press seam allowance and put aside for now. 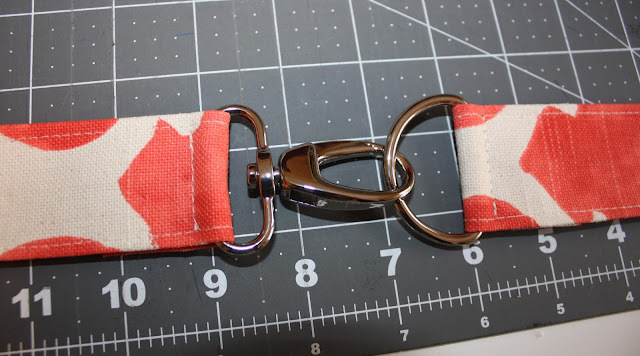 I was inspired to use this type of strap by an Emkie Designs pattern. 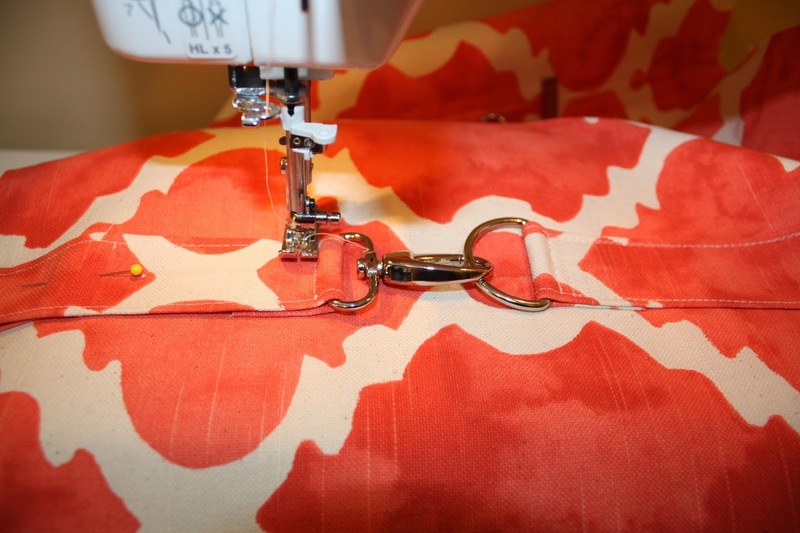 Emma uses this method of strap construction on her Ingenious Tote and Hippo Hobo bags. 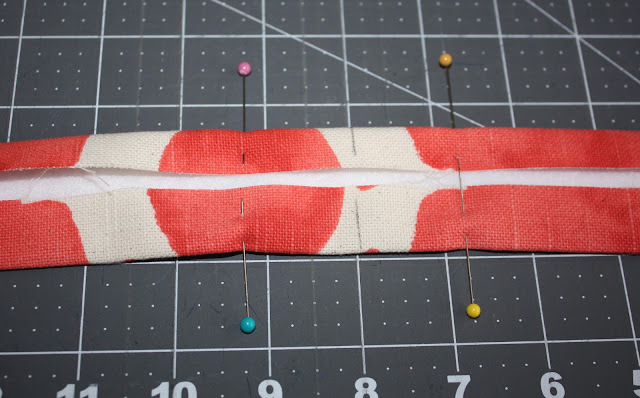 1) Cut your strap piece to be 3 inches wide by your desired length. The strap will be folded in half before being sewn so take that into consideration. I cut my strap 3 inches wide by 32 inches high. 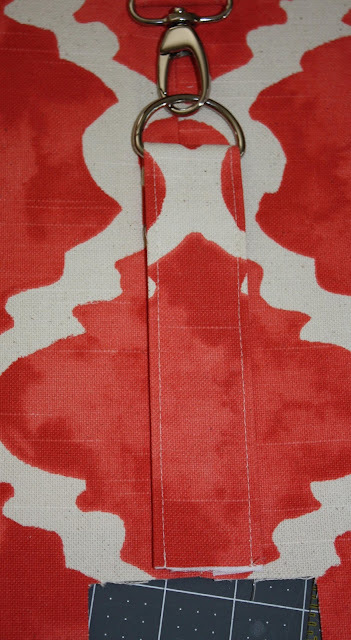 2) Cut your fusible fleece strap interfacing 1 inch wide by half of your desired length. I cut mine to be 1 inch x 16 inches. Fuse fleece centered from right to left and bottom to top on your strap fabric. 3) Press the strap in half, open up then press both halves in again. 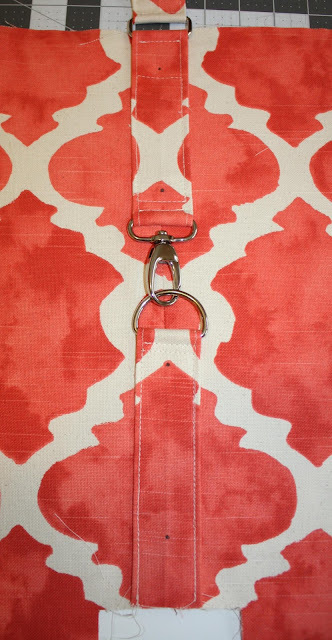 You’ll end up with a 1 ½ inch wide by 32 (or your desired length) inch long strap piece. 4) Mark the following places on the wrong side of your strap: ½ inch from each end (these will be your seam allowances), the midpoint and quarter points. 5) Measure 1 ¼ inches from either side of your quarter points and make a mark. I like to use pins here. 6) Topstitch your seam allowance down at each quarter point from one 1 ¼ inch mark to the next on either side of the quarter point. 7) Slip both rectangle rings onto your strap and move them toward the center. 8) Sew the ½ inch seam allowances on the end of your strap together, right sides together forming a loop. 9) Press the seam allowances out then re-press the strap and turn right side out. 10) Move the rectangle rings to the quarter points, make sure everything is lined up and pressed smoothly, then topstitch down each long edge. Put strap aside for now. 1) Cut your Side Accent Pieces 3 inches wide by 18 inches high. Cut your Side Accent interfacing to be 1 ½ inches wide by 18 inches high and fuse to the center of both pieces. 2) Fold accent piece in half wrong sides together, press, open back up and press each long edge back toward the center. You will now have a 1 ½ inch wide by 18 inch high piece. Topstitch down each side. Repeat with other accent piece. 3) Lay your accent pieces out on your cutting mat and cut an 8 inch section. You will end up with an 8 inch and 10 inch section for each accent piece. The 8 inch pieces will be the bottom of your hardware assembly and the 10 inch pieces will be the top. 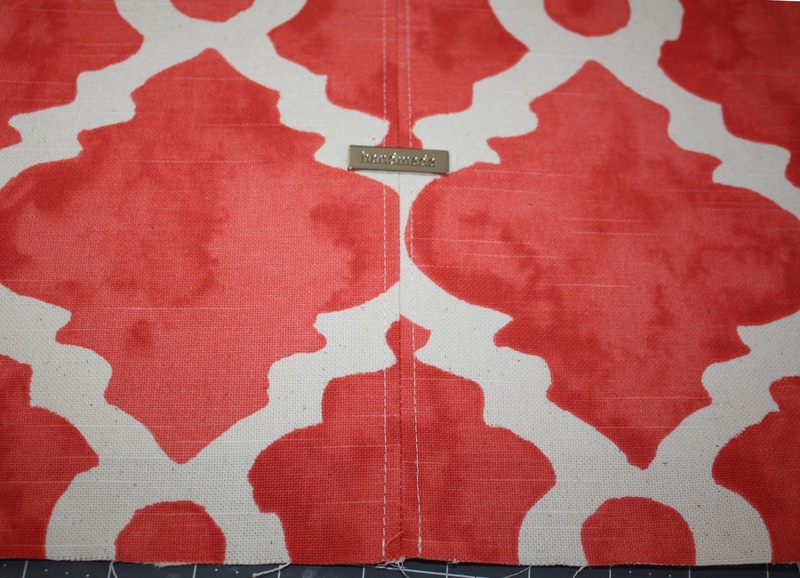 4) Slip a D ring on the top of your 8 inch accent piece, fold the top raw edge down toward the back overlapping 1 ¼ inches of fabric on the back of the accent piece. Pin in place. Repeat for other side. 5) Take your 10 inch accent piece and place your swivel clasp on the bottom of the piece, again overlapping 1 ¼ inches of fabric on the back. Pin in place and repeat for other side. 6) Grab your strap and wrap the top end of your 10 inch accent piece through a rectangle ring making sure that nothing is twisted. This edge will fold down toward the swivel clasp by 2 ½ inches. Pin in place and repeat for other side. 7) At this point you will have a long hardware assembly that will be sewn directly onto your bag. Make sure everything fits and is lining up well. There should be no slack in the hardware. If there is, adjust your pins so the assembly is taut. 8) Lay one side of your hardware assembly on the sewn seam of your main panel, lining the assembly from the bottom cut out towards the top making sure that everything is lined up. The bottom of your rectangle ring should be even with the top raw edge of the panel. 9) Check the other side of the assembly to make sure it mirrors your completed side. 10) Using your zipper foot, stitch closely to each piece of hardware securing it to the accent pieces and strap. Make sure the folded up bits of the accent pieces stay lined up on the underside. 11) Center one side of your hardware assembly on the sewn side of the bag. I find it helpful to use both pins and double sided tape here to make sure everything stays in place. 12) Make a mark with your air marker 1 inch below your rectangle ring on the accent assembly. Pin the side assembly not being sewn out of the way. 13) Sew with your regular foot over your previous topstitching, securing the accent assembly to the side of the bag. I like to turn my foot about ¼ of an inch below the zipper stitch we made earlier then head back down the other side of the bag. This will need to be done in sections. 14) When you get to the top section on each side, use the air mark you made earlier as your guide for where to turn your stitching. This will allow plenty of room for topstitching the finished bag. 15) Sew the other side of your bag right sides together and press seam allowance out. 16) Repeat sewing process for other side of the hardware assembly. Go slowly, and double check that everything stays lined up properly. 1) Using your air marker mark the following measurements, centered on your hardware assembly and strap: 1 inch from the bottom cut out, ¼ inch below the line where you turned the stitching securing the D ring to the bottom of the accent assembly, ¼ of an inch above the turning stitch securing the swivel clasp to the bag, ¼ of an inch above the mark you made with the air marker noting where to turn the securing stitch toward the top of the bag and ¼ of an inch from the zipper stitch on the handle. Repeat for other side. 2) Punch holes and install rivets based on package directions. Use Fray Check on the holes prior to inserting the rivets. Finish sewing the exterior of the bag per pattern instructions and put aside. Add the magnetic snap to the interior of the bag 1 ½ inches below the center of each interior panel. See Samantha’s Blog post http://handmadebymrsh.blogspot.co.uk/2012/07/how-to-fit-magnetic-snap.html for more detailed instructions. Complete the construction of your bag following the original pattern instructions." Thanks Amy for sharing your hacks! If you'd like to make your own Reversible hobo, you can find the pattern here in my store!